This from the first epic in the English language. A heated discussion on the heels of my previous post about the “cruel” and abhorrent atrocities committed by the heroic figures in the Odyssey set off a bottle rocket in my so called mind. I had averred that art must be understood in its cultural historic context and to dismiss or condemn any work of art because we disapprove of the mores and ideals in it is to miss the point. The history of literature and all art is in a very real sense the vivid history of our moral and ethical evolution. It is also, IMHO, a fossil record of our species’ attempts to restrain our basest most powerful instincts for a higher good: altruism, something that allows people to live harmoniously in communities and for civilization to rise and develop. From the New Yorker on Beowulf Great overview from a contemporary perspective. My fav translation of Beowulf is Seamus Heaney’s Beowulf, I guess, though I also love Tolkien’s Beowulf. 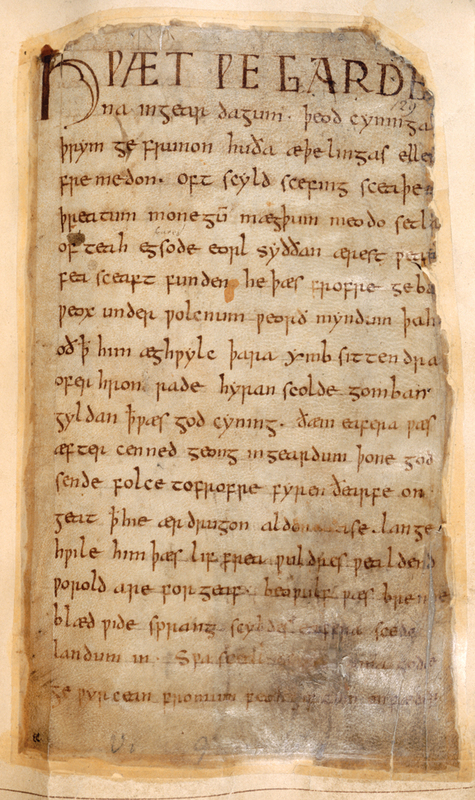 An interesting thing relative to my previous post is that though Beowulf was brutal and in a sense monstrous, he slays three MORE brutal, hideous monsters–to save his friends. Inch by inch we become kinder, more considerate. This entry was posted in Literature, poetry, Reading and tagged beowulf, epic poetry, grendel, Seamus Heaney, Tolkien. Bookmark the permalink. I love love love this! I actually revisited Beowulf recently, and I totally agree that our notions have been changed by society and culture. I write about this type of subject on my blog, theparisreviewblog.com, so I love finding others who do the same! Great post. ‘Art is a fossil record of our species.’ – just about the best (and most impressively pithy) explanation for the value and importance of art I’ve come across. Very cool. Hey, now, I never suggested dismissing Homer! My comment was about the “where-have-all-the-heroes-gone” school of classics. That’s a whole different kettle of fish. I think we are beating a dead horse at this point Mikels. Beneath our quibbles is a basic agreement: Nice is nice and preferable to slaughter, beheadings and that hideous yuk. Perhaps, I will grant you, I overstated my point about the dearth of heroes; I surely wasn;t suggesting infanticide and maiming are ever excusable. Context! Context is everything! Where have you been? Do you mean Clerk’s Tale from Chaucer’s Canterbury Tales? sit down and do it. Don’t expect it to be perfect. You have to keep the doors of your mind open as a writer by writing something everyday. Most of it will be trash but the good stuff will come eventually. It’s a process. The longer you are away from writing, the colder the trail gets.